Both of my warring planners (Mole weekly notebook vs. Quo Vadis Minister) lack a calendar format that I like to have in my planner: a monthly format with the days as squares that I can write in. Even though both of these planners have the year with the months as numbered days (which I use), the months as columns (which I use extensively) and the weekly view, I still need MORE COWBELL!! I mean, uh, calendars. Yes I have a monthly wall calendar, but I prefer to have it contained in my book. 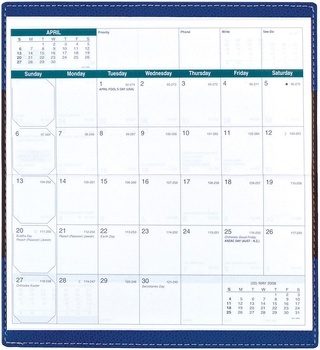 3) the Visoplan (a 12 month calendar) is slimmer than the Exaplan (a 21 month calendar, which I don't need right now). Both use the gorgeous-to-write-on Clairefontaine paper, which is my favorite paper in the world to write on. (Fact: the draft of this post is written in one of my Clairefontaine notebooks. The yellow one, to be exact!). I ordered up just the Visoplan calendar refill (without a cover, for maximum slimness) which was only 3 bucks on TheDailyPlanner.com. While I was ordering I threw in a few Clairefontaine notebooks I've been wanting too! So no matter which planner wins, it will be complete with the addition of the Visoplan. Then I will have every permutation of calendar I desire in one book! Perhaps the designation of The One with the addition of the Visoplan will allow me to find, as my sister calls it, Planner Nirvana! This has nothing to do with planners, but I want you to know I shot iced tea out my nose at your mention of MORE COWBELL!! LOL!!! Did you follow the link to the skit??? I love that one. Do you have any suggestions on how to use the monthly view? I have a planner, from Muji, with weekly views with plenty of room for tasks—I usually have just a few appointments and put the rest of my life as freeform tasks—but also big, gorgeous monthly views which I don’t know what to use for. I use monthly views to see things that are coming up later in the month that I need to prepare for or just be aware of. For example, I put the due dates for all my bills every month so that I know how to budget my money throughout the month depending on when things are due. I also put any deadlines, travel, or other things coming up throughout each month. In addition to planning ahead, I use the monthly calendars to record things for easy reference, to see patterns, etc. A good example of this is I record my exercise on the monthly calendar. I can see when my workouts were, how often I did cardio vs strength training, what days of the week I was more likely to work out or not. Another thing I write on the monthly calendars is when I order something online, so I know when to expect it to arrive. So if it's been awhile and hasn't arrived yet, I can look back at what date I ordered it and call them up if I need to. So when do you enter these monthly deadlines in and when do you look at them? That bill/due-thing might be a good idea. My planner has a small space at the top of each week, about as big as a weekday but not assigned to a weekday, where I usually put a small reminder about something coming up in the week after. When I receive a bill, I immediately write the due date into my calendar. In the past when I have written my bills due on a monthly calendar (with amounts due), it lets me see how much money is due when. So, for example, if I have most of my bills due in the second half of the month, it lets me see that I need to save X amount of money from the first paycheck of the month to cover those expenses. Like you, I also write things at the top of my weekly page that are coming up in the next or later weeks. If I have something big coming up that I need to prepare for, like a trip, I write at the top of my weekly page "# of weeks until X" so that it reminds me to prepare for it. I just wanted to say I was entirely confused about the exaplan and the visoplan until your review pointed out the space for weekends, I was thinking the exaplan because it opens vertically but you can't beat the space to weekend. I had to get a minister, thank God they just released an academic year version, my one gripe with planner is I love academic year planners as I am a mum and it is just the right time in my life to get a new journal.